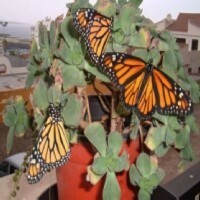 Earlier this year I wrote about my one-man conservation project to help the Monarch butterfly (Danaus plexippus) here on Tenerife and I managed to rear nine to their glorious adult form feeding them on plants I was growing on my balcony and topped up with some fresh leaves I was getting from elsewhere. Of course, the butterflies could see they were on to a winner here and the females came back and laid even more eggs. Only problem is a couple of Curacao Milkweed (Asclepias curassavica) plants on a balcony is nowhere near enough food for the greedy caterpillars and even when a stalk is sprouting new leaves it can’t keep up with the voracious stripy little grazers. Especially when Mother Monarch lays another batch of eggs on every bud as well. The caterpillars are attractively marked with black, yellow and creamy white stripes, which are warning colours telling would-be predators I don’t taste good and in fact can even poison you! The Monarch larvae are able to absorb the toxins from the plant and they keep this poisonous defence right through into their final metamorphosis as a glorious orange-red and black-veined butterfly. Monarchs are also known as Wanderers, and this name is very apt because on rare occasions they “wander” as far as the UK and in America they perform an incredible migration from the northern States right down to Mexico and California. The Monarchs I have been rearing haven’t been that way inclined though and tend to stay in my neighbourhood making regular flights past my balcony. Tiggy my cat is very interested in them but her fascination with flying creatures is different to mine and she caught a female Monarch some weeks ago. Luckily for the hapless butterfly I was quick enough and able to pry it out of my pet’s mouth and it flew away with just a few small tears at the bottom of its wings. Tiggy also likes to catch and eat Ear Moths (Amphipoea oculea), named after a small ear-shaped whitish mark on their brown wings, but I don’t bother to rescue them because they absolutely defoliated my basil plants and then started on my chayote squash. The Ear Moth looper caterpillars are camouflaged in a green that matches the leaves and the female moths when they emerge from their cocoons do just what the Monarch butterflies do – they return to my balcony and lay more eggs. Besides being something for Tiggy to hunt I reckon they make good food for the pair of bats that I often see flitting by in the twilight. That’s something I am very aware of, that animals need the right food and if it’s in short supply then they have big problems and so it is for the Monarch butterflies here – they are limited in their numbers by the amount of Milkweed plants on the island. Actually there is another food plant for Monarch caterpillars that grows on Tenerife, which is the Swan Plant (Gomphocarpus fruticosa), or Tennis Ball Bush, as it is also known due to its inflated seedpods. It is said to grow well in dry sunny areas and we have plenty of them, but I am yet to see my first Swan Plant on Tenerife. My friend Pamela Heywood, who runs secret-tenerife.com website told me she had some growing near her and could get me some seeds. Yes, please, I said but she got back to me to say that sadly all the plants had vanished. Maybe the Monarch caterpillars ate them I thought! The Curacao Milkweed is called Flor de Bandera Española in Spanish, meaning Flower of the Spanish Flag because its red and yellow colour match those of the flag of Spain. If we had more people cultivating Curacao Milkweed and if the authorities on Tenerife had this flower planted in more parks and borders then we’d see a lot more of these beautiful creatures. And growing this plant would be a patriotic thing to do! I am doing what I can to grow more Milkweed but I just can’t keep up and have had tiny seedlings just showing their first leaves eaten overnight by the caterpillars. It got to the point where I was forced to make a long journey all the way down to Costa del Silencio to a flower border I know there where there are several clumps – enough to get a fresh supply of leaves for the large caterpillars I had and to release all the recently hatched small ones on to. I had wondered why the Silencio plants were free of caterpillars but thought all the more food for the ones I was letting go. A few days later I found out why - I was once more in Silencio on my way to Flicks Bar and thought I’d see how the caterpillars were doing but was shocked to find I couldn’t find one. Then I saw a solitary wasp arrive and I realised – I had been supplying her with food for her own larvae and it was a real sting in this tale! If you get any caterpillars you won't have enough because they eat loads of their foodplant. Yes, they can only eat species in the milkweed family. There are many species. Good luck with yours and I hope you can get some seeds! I was just given 1 milkweed plant today to get me started, I have read that they only eat milkweed...I'm assuming the plants on this page with different names are all in the milkweed family? I won't get far this year with just one plant, but hope it will spread. Thank you, yes that is what I try to do! How cute, you could help the monarch butterflies to breed and enjoy seeing them grow. They are very attractive. What a brilliant idea. Well done for spreading the word about these beautiful butterflies. Stinging Nettles are a food-plant for many caterpillars and an edible weed that humans can eat too. Caterpillars should turn into pretty butterflies, all going well, but sometimes this doesn't happen if a parasitic fly gets to them first.